For social change, "ownership design is the most foundational". Here is where we document material on the third aspect of commons-based peer production ("Peer production, peer governance, peer property"). We're big fans of the FairShares model, see New Cooperativism and the FairShares Model . Check out the use of Redeemable Preference Shares‎‎ (also called Capped Returns, by the Enspiral cooperative coalition, which allows them to accept external funding without losing control as a coop, while being able to develop Commons-based resources. "Peer to peer social processes are bottom-up processes whereby agents in a distributed network can freely engage in common pursuits, without external coercion. It is important to realize that distributed systems differ from decentralized systems, essentially because in the latter, the hubs are obligatory, while in the former, they are the result of voluntary choices. Distributed networks do have constraints, internal coercion, that are the conditions for the group to operate, and they may be embedded in the technical infrastructure, the social norms, or legal rules. 3) Peer Property: the institutional and legal framework they choose to guard against the private appropriation of this common work; this usually takes the form of non-exclusionary forms of universal common property"
= a clear distinction is to be made between resources owned in common (common property) and resources for which no property rights have been defined (open access). Alienation: A right to sell or lease any of the above rights "
Stefan Meretz has produced, with his daughter, a very useful and clear taxonomy of common goods, according to five criteria. Pauline Schwarze and Franco Iacomella provided translation support, from the original German to English. "These have played an important role in the creation of utilities of various kinds from grocery distribution to telephone networks. Generally the members contribute capital to build some piece of shared infrastructure. Copyright Monopoly Stands in Direct Opposition to Property Rights. By Rick Falkvinge. An Ideological History of the Urge to Own. An excerpt from chapter four of Charles Eisenstein's book on Sacred Economics. Marjorie Kelly: Not Just For Profit: Emerging alternatives to the shareholder-centric model could help companies avoid ethical mishaps and contribute more to the world at large. Explores three new-style corporate designs: 1. stakeholder-owned companies; 2. mission-controlled companies; and 3. public-private hybrids. It is very important to distinguish the four different degrees of freedom], culminating in Triple-Free Software and peer production. An insight from Tere Vaden. Richard Stallman argues forcefully, that we should not use the muddled concept of IP, and explains Why Software Should Not Have Owners. Play Struggle, excerpts of the book Hacking Capitalism by Johan Soderbergh. New Cooperativism and the FairShares Model: in this article about the FairShares Model by Rory Ridley-Duff. , there is a useful history of the evolution of thought and practice of cooperative property, with a graphic summarizing the different schools of thought and how they converge in this new model. Pat Conaty and Mike Lewis, the Resilience Imperative. Chapter 11 focused directly upon your question about Ownership transfer mechanisms and what these look like including the roots of the idea in the 1820s with the insights of Thomas Spence the ingenious proponent of working land trusts (see chapter 4), the brilliant French Swiss political economist, Sismondi and working up from there through the Chartists, Ruskin, other co-operative commonwealth visionaries and practitioners through to Gandhi's trusteeship concepts, CLTs, Democratic ESOPs, the Co-operative Land Bank etc ... "
Ulrich Duchrow. Property for People, Not for Profit. ZED Books, 2004: history of extractive property, and its alternatives. "In ownership design, there are five essential patterns that work together to create either extractive or generative design: purpose, membership, governance, capital, and networks. Extractive ownership has a Financial Purpose: maximizing profits. Generative ownership has a Living Purpose: creating the conditions for life. While corporations today have Absentee Membership, with owners disconnected from the life of enterprise, generative ownership has Rooted Membership, with ownership held in human hands. While extractive ownership involves Governance by Markets, with control by capital markets on autopilot, generative designs have Mission-Controlled Governance, with control by those focused on social mission. While extractive investments involve Casino Finance, alternative approaches involve Stakeholder Finance, where capital becomes a friend rather than a master. Instead of Commodity Networks, where goods are traded based solely on price, generative economic relations are supported by Ethical Networks, which offer collective support for social and ecological norms." For Stevenson, a “private property, common property, open access trichotomy” ultimately exists. He compares these three forms in terms of group limitation and extraction limitation. Characteristic of the common property form is that both the group and the extent of resource use are limited by the individual members. "One age builds upon the last. We do not go back, but carry forward the former ages in new ways. In the industrial age, we industrialized agriculture. In the age of finance, we financialized industry. As we move into a more ecologically sensitive era, we will need to ecologize finance. And we will need to socialize it — make it more inclusive, less elite. Redesigning the social architectures of our economy is a vital part of transformation—as vital as redesigning the physical architectures of our energy and product system. My sense is we are … entering an era with a multiplicity of ownership designs – a time of biodiversity in social architecture, beyond the monoculture of the corporate form." "The commons breaks with the individualistic vision as conceived by the capitalist tradition, a vision that has progressively transferred the idea of rights to individual people. The commons take inclusion and everyone’s equal right to access as its starting point, while property and the idea of the state that upholds it is based on a rivalry of goods, and thus on exclusion and concentration of power in institutions that insure and protect it. The commons try to situate themselves outside the subject-object reductionism that would lead to their commodification. The commons cannot be commodified (because they cannot be transferred, or alienated), and they cannot be the object of individualised possession. And so they express a qualitative logic, not a quantitative one. 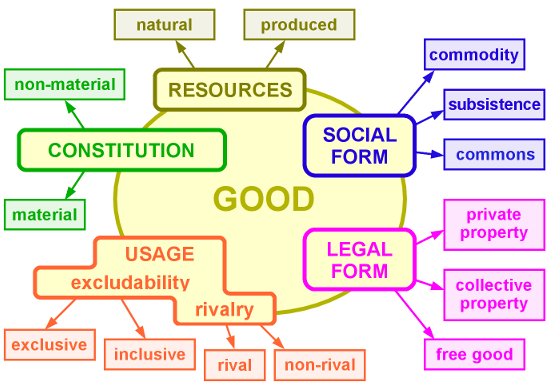 We do not ‘have’ a common good, we ‘form part of’ the common good, in that we form part of an ecosystem, of a system of relations in an urban or rural environment; the subject is part of the object. Common goods are inseparably united, and they unite people as well as communities and the ecosystem itself." "Imagine a world where property is owned because it is being well stewarded rather than ownership being a priori to stewardship. Much of the worst behavior we see in the economy would be impossible, because the second any firm stopped stewarding their properties for the benefit of the larger community, they would no longer own their properties (intellectual or otherwise). In this world ownership is derived from good stewardship, rather than the other way around." At the center of the digital revolution, with the executable bitstreams that make everything else possible, propertarian regimes not only do not make things better, they can make things radically worse. Property concepts, whatever else may be wrong with them, do not enable and have in fact retarded progress. In the network society, anarchism (or more properly, anti-possessive individualism) is a viable political philosophy … because defection is impossible, free riders are welcome, which resolves one of the central puzzles of collective action in a propertarian social system. "In Roman law, property, or dominium, is a relation between a person and a thing, characterized by absolute power of that person over that thing....Human beings can have relations with one another. But what would it mean to have a 'relation' with a thing?.... [But,] Imagine a man trapped on a desert island. He might develop extremely personal relationships with, say, the palm trees....and, if he's there too long, he might well end up giving them all names and spending half his time having imaginary conversations with them. Still, does he 'own' them? ....Clearly, then, property is not really a relation between a person and a thing. It's an understanding or arrangement between people concerning things." "As long as we focus on types of ownership, we seem to be leaving out all who are not owners. That is one reason I argue for a civic based economy rather than a property-based economy. I am certainly for employee ownership and worker co-ops. One needs to remember, however, that property and ownership are legal concepts, or civic concepts. In "Civilizing the Economy I tried to develop a civic view of ownership and of property. The civic is about membership and the rights of members to control their lives, rather than have their lives control by owners. Ownership, in my view, should rest on a civic foundation." This page has been accessed 75,983 times.